These deers - those in the vintage post card and the toy I glued down in front are sending their wishes to you from the little gift box I altered. 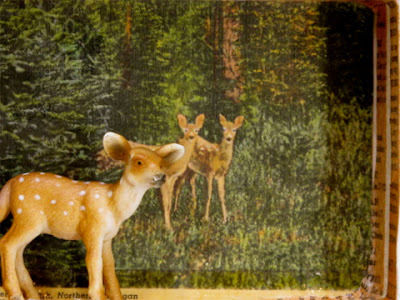 In folklore, deers are associated with a voyage to paradise and I did not make that up. It's really not so far fetched that these creatures of such sweet spirit should carry a message of fantasy and hope. Here's hoping it's a great day in your world too. deer a plenty in my woods. Last post..funny cat! my cats have been jerks lately.I can make bad kitty movies. They think they are the boss of me.